Forensic nurses specialize in caring for victims and perpetrators of traumatic events or criminal acts that results in trauma or death. While caring for their patients, the forensic nurse is also responsible for observing, recognizing , collecting, and documenting forensic evidence related to the traumatic event or criminal act for subsequent use in civil or criminal legal proceedings. Forensic nurses are often called upon to testify in court as an eye witness. They are also called upon as expert witnesses to give an opinion on a particular situation. Forensic nurses are trained in skills such as evidence collection and forensic photography. 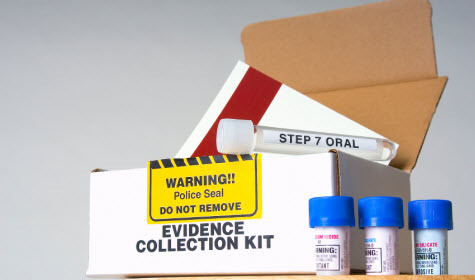 The most common role for a forensic nurse is that of a sexual assault nurse examiners (SANEs). SANEs offer care to victims of sexual assault. They assess injuries of the victim, collect forensic evidence , and testify on behalf of the victim in the court room. Forensic nurses often work as nurse coroners or death investigators. In this role they use their nursing skills to work as a crime scene investigator. They have the authority to confirm or pronounce death, identify the deceased, and to notify the next of kin. Forensic nurses use their skills to determine the social and medical history of the deceased, to examine the body, and to investigate the scene. Forensic psychiatric nurses perform some roles that are similar to correctional nurses. Both often work in state-run correctional and mental treatment facilities. They are often called upon to use their health care training to assess the mental state of suspected offenders before they are transferred to a county jail or other correctional facility. If they deem that the suspect is a danger to others, they may be placed in a restricted environment such a maximum security facility or solitary confinement. If diagnosed as suicidal then the suspect might be placed on suicide watch. They may also be asked by law enforcement to interview traumatized victims to obtain their account of an incident. A forensic psychiatric nurse is not an advocate for victims. Instead they are called as witnesses to assess the state of mind of both the victim and offender. Forensic gerontology specialists help investigate the abuse, neglect, and exploitation of seniors. They work as advocates for elders by raising awareness of elder-related legal and human rights issues. They often work in nursing homes and other facilities which take care of the elderly. Forensic nurses often work as legal nurse consultants. They aid attorneys on cases that might involve medical malpractice, personal injury, workers’ compensation, or any other cases where the law and medicine overlap. These are but a few of the roles that forensic nurses might fill. The majority of forensic nurses work in or with hospitals. They often work in operating room settings, though they are usually on a team separate from the normal ER staff. This allows them to perform thorough examinations, collect and document all pertinent forensic evidence, and spend time on their patient’s physical and mental recovery from the trauma. They are also frequently employed in jails , prisons, other correctional institutions, and coroner’s offices. Some work as private consultants for attorneys, insurance companies, and various law enforcement agencies. Obviously, being a registered nurse is a prerequisite to being a forensic nurse. This means completing a diploma, Associate’s, or Bachelor’s degree program in nursing. An alternative for those who already hold a Bachelor’s degree in a non-nursing field of study is to complete an accelerated direct entry Master of Science in Nursing program. Once a nursing program has been completed, the individual can become a licensed registered nurse by passing the NCLEX exam. Working under a trained forensic doctor or nurse. Completing a certification program in forensic nursing offered by a university separately from their undergraduate and/or graduate degree programs. Completing continuing education courses in forensic nursing. Completing a Master of Science in Nursing or Doctor of Nursing Practice degree program with a formal forensic nursing specialization. The American Nurses Credentialing Center offers a certification program in forensic nursing. This program is unique in that rather than passing an exam to obtain certification, nurses submit an online portfolio of evidence to document their competency in forensic nursing. If the nurse passes the portfolio assessment then they are awarded the credential Advanced Forensic Nursing – Board Certified (AFN-BC). Two certification are offered by the International Association of Forensic Nurses through its Forensic Nursing Certification board in the subspecialty of sexual assault forensic nursing: the Sexual Assault Nurse Examiner – Adult/Adolescent (SANE-A) and the Sexual Assault Nurse Examiner – Pediatric (SANE-P) certifications.